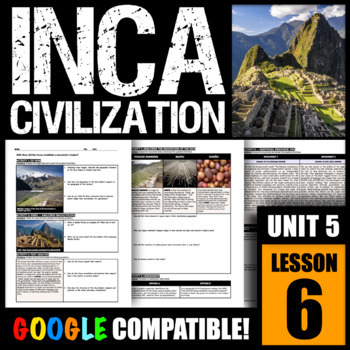 How did the Incas establish a successful civilization? 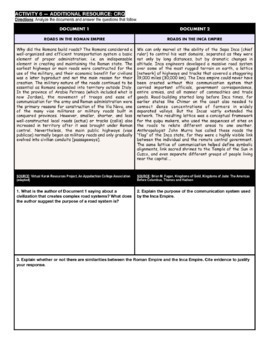 ACTIVITY 1 -- GRAPHGIC ORGANIZER: Students will complete a graphic organizer in which they will analyze a text in pairs (or individually) and determine the geography, religion, art, politics, economics, and social hierarchy of the Inca people. 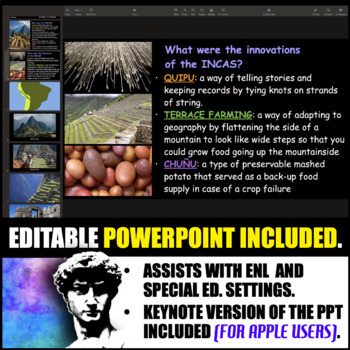 ACTIVITY 2 -- VIDEO: Students will analyze a video to understand why the Incas built Macchu Picchu and how they innovated with terraced farming to adapt to their geography. *LINK IS PROVIDED* -- in my district, YouTube is enabled. Check to make sure that YouTube is enabled in your district prior to purchase. If not, substitute for a video of your choice. Word Doc is provided for editing. ACTIVITY 3 -- CRQ: Students will complete a CRQ in which they have to compare two documents about the Incas. 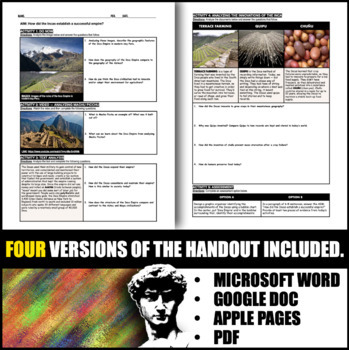 ADDITIONAL RESOURCE INCLUDED: PowerPoint with photos of Incan artifacts.